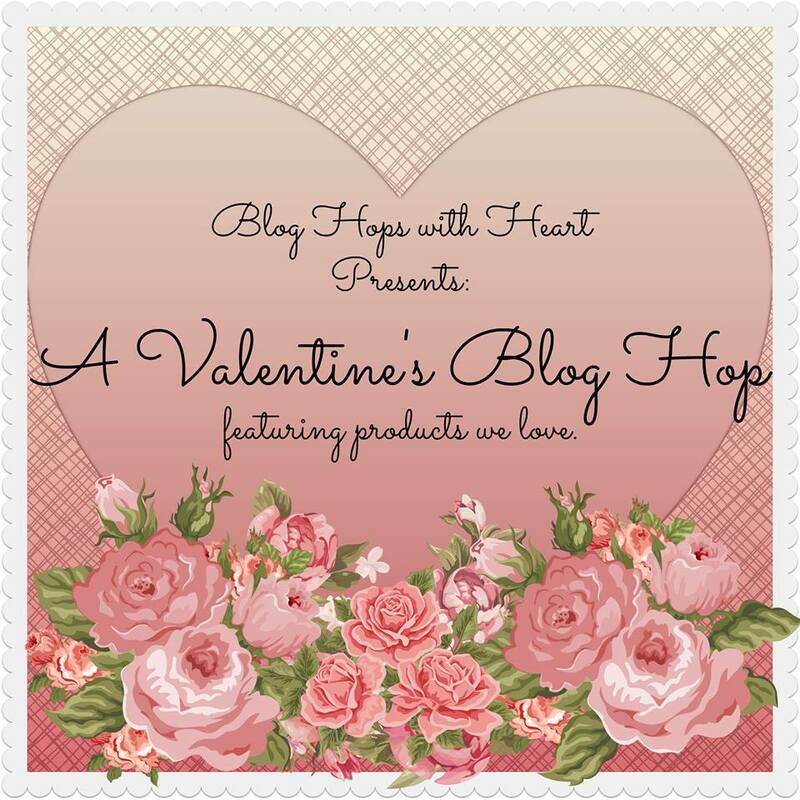 Welcome to Blog Hops With Heart Valentine blog hop featuring products we love! If you started at the beginning you would have come from Amie Kiger’s blog, but if you’ve started here you can still make it around the circle by clicking the link at the bottom of my post. 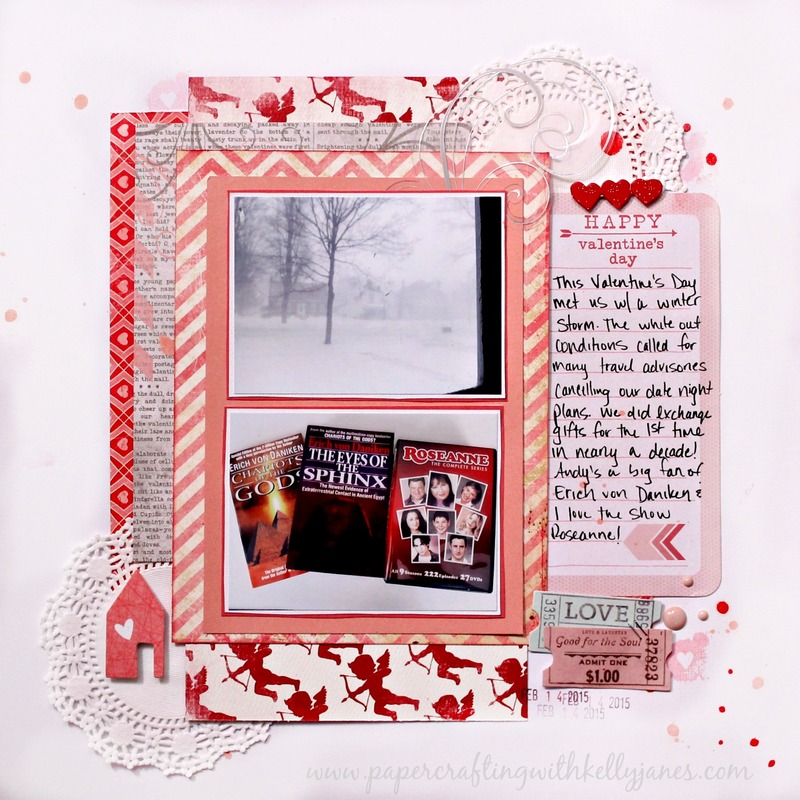 My project today is a Valentine themed layout that was inspired by Big Picture Classes. One of the first classes I took was a 30 Minute Layout Class. There were so many helpful tips and after taking 76 classes (and counting) it is still one of my absolute faves! It transformed the way I organize my ever growing stash of products and I also discovered my love for a long reach stapler after taking this class! Seriously, one of the best products I’ve purchased in a long time! For my layout I started with a white cardstock base and then layered multiple patterned papers from Crate Paper. I also threw in a newsprint B&T from the the retired CTMH Heartstrings Paper Packet. I didn’t get any photos of my husband and myself on Valentine’s Day because our plans were cancelled due to weather. So I snapped a couple photos of the gifts we exchanged and also of the weather from that day. I typically scrapbook photos of the people I love, but I love that these photos are a little out of the ordinary for me because they document the memories from that day perfectly! The photos were matted on white cardstock, followed by Hollyhock Cardstock, and a final layer of retired blush cardstock. After I had my paper arranged the way I liked I just started throwing on embellishments from Little Yellow Bicycle, My Minds Eye, Amy Tangerine, and a few other pieces from my stash including doilies. 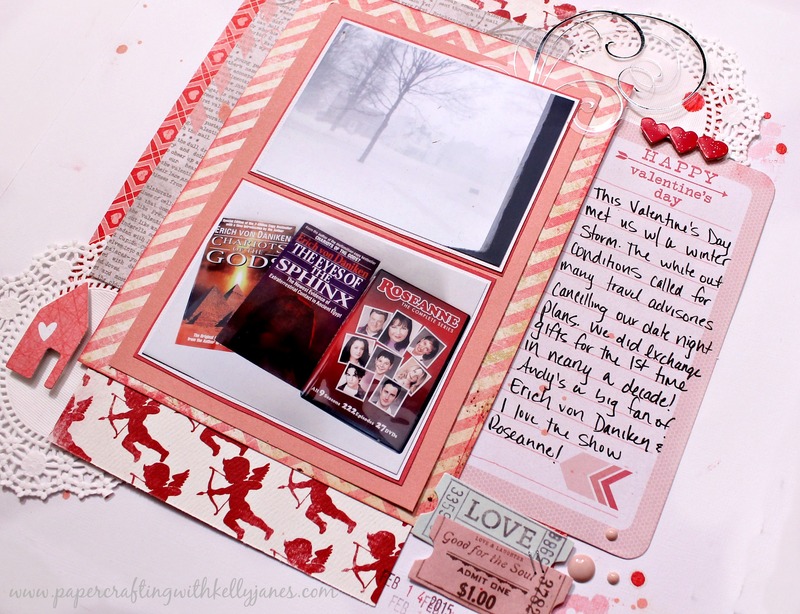 The journaling card is from the retired CTMH Heartstrings Picture My Life Kit. I used the Heartstrings WOTG Stamp Set in Hollyhock Exclusive Ink™ for the title on the journaling card. For final touches I splashed some pink & red mists from October Afternoon & Heidi Swapp. I also added the little splashed stamped hearts from the CTMH Documenting Moments Stamp Set in second & third generation Hollyhock Exclusive Ink™. Now you are off to Becca Whitham’s Blog! I was fortunate enough to see a sneak peek of her Valentine’s project and I know you won’t be disappointed! Thank you so much Stephanie! I always enjoy reading your comments! I think you should totally document your story too! I’m even stepping out of my comfort zone and scrapbooking a little about JUST ME! What?!?! I can’t even believe that I have pages just about me, but what is it that Stacy Julian says….There is only one story you are qualified to tell…your own. After I heard that it changed the way I look at what I scrapbook. So glad you were inspired! Can’t wait to see what you create!! I’m not sure if I love you or hate you right now. Seriously…you blow me out of the water with your talent. I wish you could see the fumbling on my keyboard as I’m trying to respond to your comment. I’m speechless and what I’m going to write isn’t going to give justice to this HUGE compliment!! I’ve admired your artwork for years so this is seriously one of the biggest compliments I have ever received since I’ve joined the blogging world! Thank you so much!